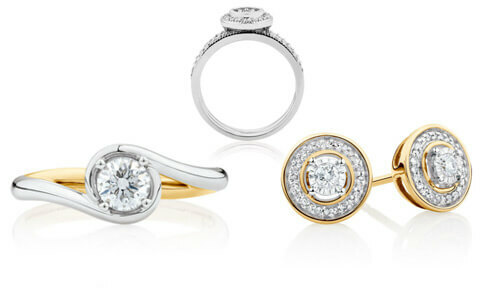 Michael Hill International (MHI) is a jewellery company that was founded in 1979 and operates across Australia, New Zealand, Canada and the United States as Michael Hill Jeweller and Emma & Roe. MHI partnered with Amblique to re-platform onto Salesforce Commerce Cloud in late 2013. MHI’ss eCommerce channel has grown steadily and the business is committed to leveraging the platform capabilities to engage existing and new customers, and drive revenue for the business. Recognising that online research is a key element of customers’ purchase path, the focus is to optimise the MHI customer experience online. Product information online is comprehensive and aims to address common queries a customer may have during the purchase path – whether they choose to buy online or in-store. Content and articles also aim to educate and build the confidence of users to select the product that best suits them . With a strong company heritage, the sites also inform customers about the brand story and philosophy . Additional elements such as customer reviews assist prospective customers on their purchase path. 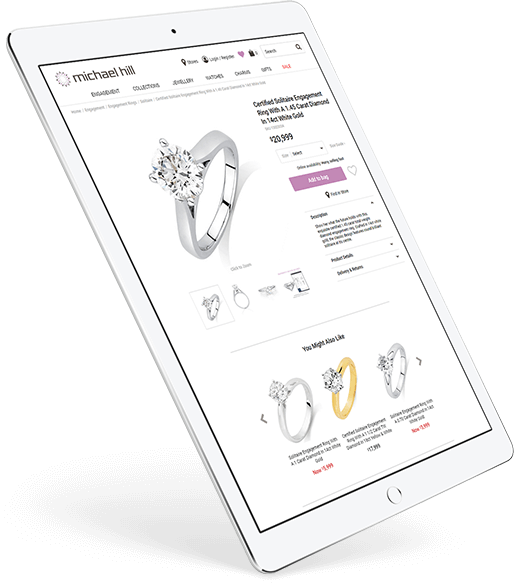 Interactive tools such as a Size Guide help customers understand relative sizes of the different products such as earrings, rings and carat weights. Complimentary gift wrapping, free delivery for order over $100 and a simple returns & refund process are all communicated clearly to assure customers in their purchase journey. 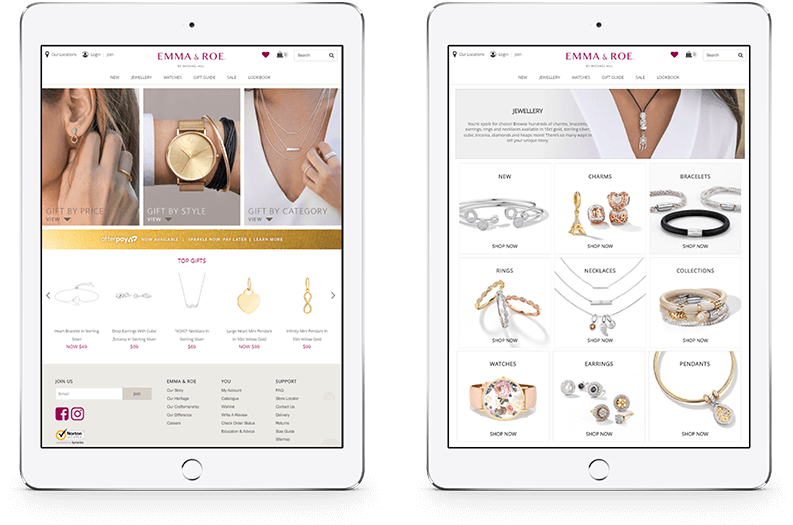 With their longstanding history in the jewellery industry, we knew that any digital offering would have to match these standards, with both internal and external expectations being high. A traditionally high-touch product such as jewellery definitely needs to offer the customer a ‘close to store’ experience. 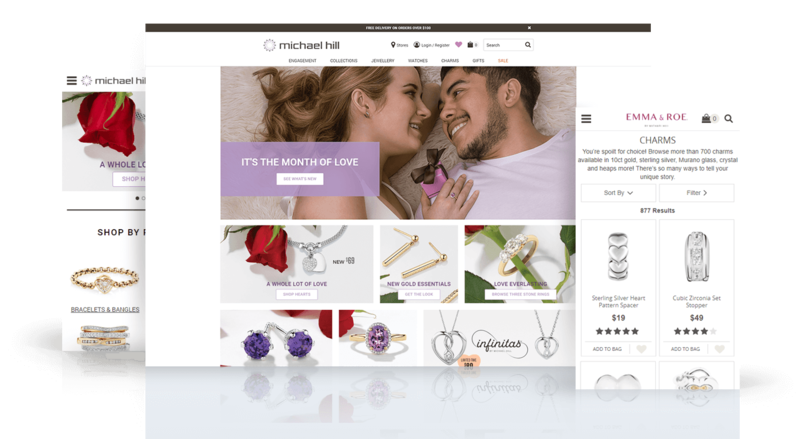 Michael Hill Jewellers were conscious of this when designing their online offering and, as a result, implemented features to match the in-store experience. 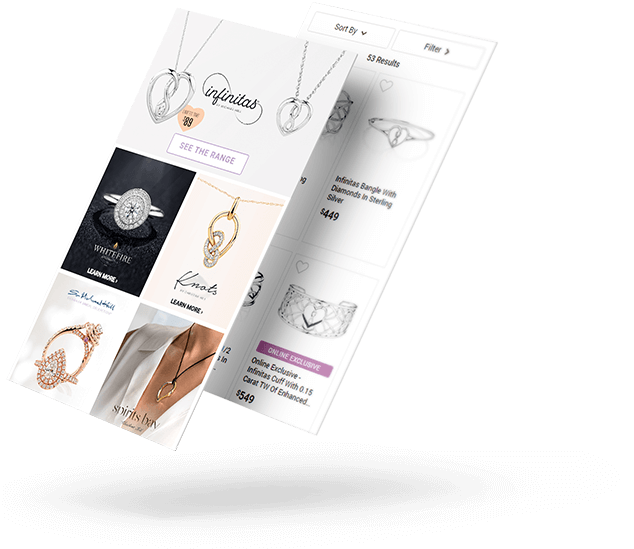 One such feature is ‘The Size Guide’, an interactive sizing chart that allows the customer to see to-scale versions of chains, rings, carat weights and earrings on a model. Additionally, in November 2016 we implemented AfterPay for the Michael Hill customer. This is one of the most innovative finance tools on the market and Michael Hill was excited to be able to offer it. With the nature of this payment solution meeting market trends and demands, it allows Michael Hill yet another avenue to increase purchases with their company online. From everyday merchandising and content updates, to ongoing site functionality improvements, the MHI eCommerce team are focused on how to deliver the best possible shopping experience. In collaboration with Amblique, they strive to offer their customers a perfect balance of both a technical and a style driven experience online. MHI believe being aware of the newest market trends allows them to provide constant updates to their sites that benefit all of their customers. This includes regular refurbishment of their site design and user experience. Simplification of navigation, optimisation of page structure and commitment to a mobile first approach. MHI aim to go the extra mile to create a unique and functional offering for their customers. 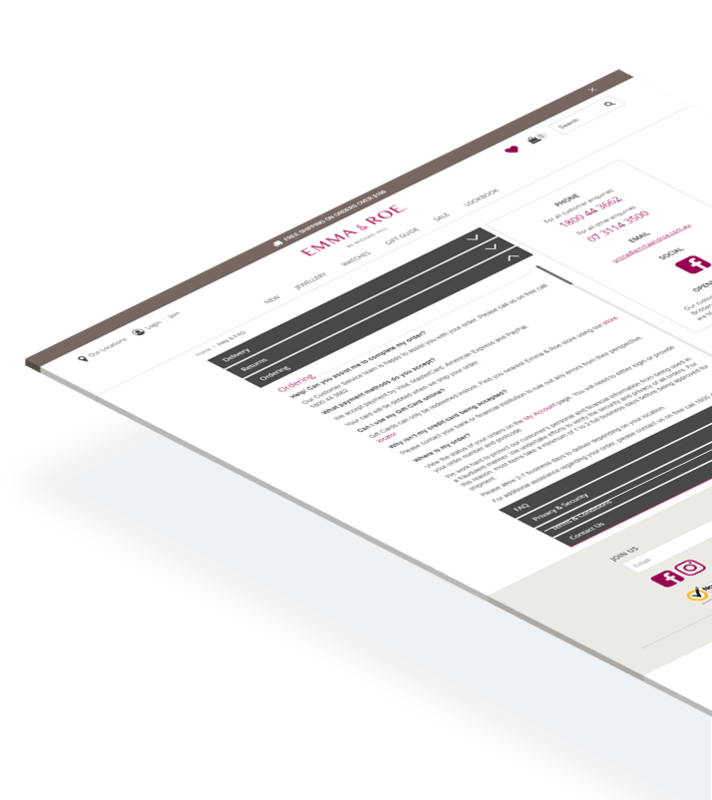 Shoppable Wishlists are popular amongst the MHI customers – they use the Wishlist to create shareable gift suggestions, shopping lists, or just to drop a hint. With the nature of jewellery being quite technical, MHI believe offering their customers the ability to search via metal, cut, stone and more is crucial. With most of purchases at MHI having an emotional foundation, they have found that the more information they make available to their customers, the happier they are with their overall experience with Michael Hill. With the nature and purpose of MHI products, the purchase of them is often an emotional one. In relation to this, customers have conveyed to them that they frequently browse online before heading in-store, in order to narrow down their favourite pieces. With so many beautiful products on display in-store, this benefit of web-rooming can take some of the pressure of the purchase out of the equation. The MHI eCommerce customer service team responds to customer queries via phone, email, social and web chat. While they adhere to a framework for issue resolution, they also review every case and work across all business divisions to deliver a solution for customers. The team have detailed product knowledge and provide a key service for the MHI customer as well as the network of over 300 retail stores and front line teams. Their customer service team undertakes the same product knowledge training as in-store team, which allows them to offer the same level of support that a customer can receive face to face in-store. They work closely with retail teams to understand local challenges, such as bad weather which may impact shipping timescales. 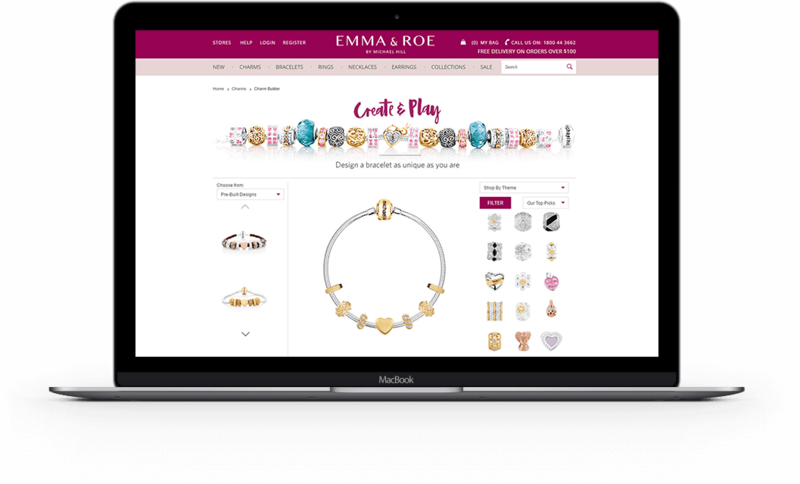 The bracelet builder is a novel feature that enables customers to design, share and order their own unique piece. The application allows a broad range of SKUs and the possibility to create thousands of different and unique designs. 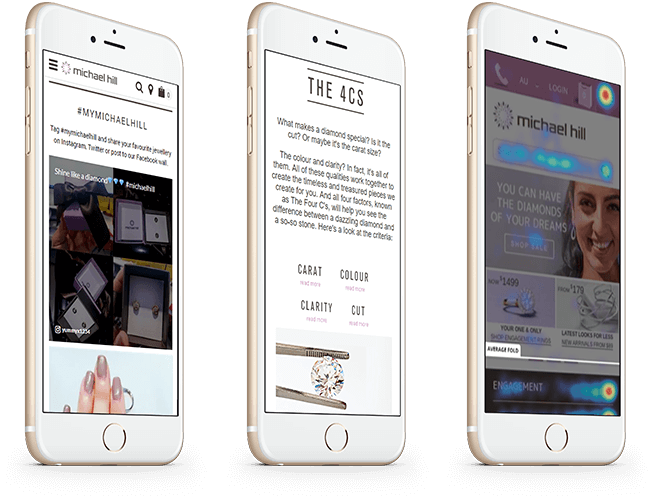 Michael Hill also creates design recommendations that can also be personalised, so customers have a starting point to help create their own unique and beautiful bracelet. Across Michael Hill and Emma & Roe, the focus is on delivering the best possible experience online and evolving to meet customer needs.